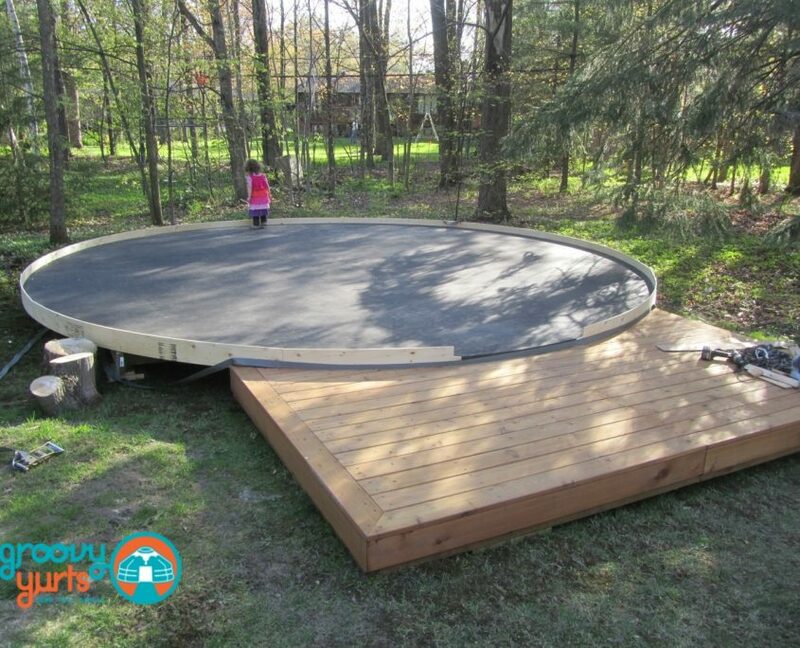 Groovyyurts sells great insulated and transportable platforms, made in Canada. They can be assembled within minutes and require only a very simple sub frame or can even be installed directly on a gravel ground. Made in Canada on a SIP panel principle and a strong tongue and grove construction, they are easy to disassemble and transport. These platforms will really save you a lot of time and hassle! Check the pricing in our online catalogue.You can build your own wooden deck and find plans online. We have also installed yurts on concrete platforms, floating platforms or even straw bale platforms (covered with plywood, it offers a great alternative for a decently priced insulated platform). You can insulate your platform and have even water and electricity run through it. It is important to install a rim around the platform, which will be useful as a stop against lateral winds, to overlap the covers and evacuate rainwater and to prevent smaller animals to enter the yurt.